Rio Verde is a private golf course community near McDowell Mountain Park northeast of Scottsdale. This 55+ community features 980 custom homes and just a few vacant lots. The 18-hole White Wing and Quail Run member-only golf courses are reserved for homeowners and guests of Rio Verde. The Quail Run and the White Wing golf courses were designed by Fred Bolton and renovated by Tom Lehman. They are traditional grass tee courses that enjoy magnificent views of the surrounding peaks. A 27,000 square-foot country Club clubhouse features a pub area, casual grill and fine dining restaurant. The clubhouse is surrounded by a large terrace ideal for watching beautiful Arizona sunsets. The 18,000 square-foot Rio Verde Community Center features a fitness center, hobby studios, and a library. Outdoors you will find a heated pool and spa as well as miles of walking and biking trails that wind throughout the community. An inter-denominational church serves both Protestant and Catholic religions. The Rio Verde Tennis Club has six tennis courts, a pro shop and year-round tennis pro for lessons. Rio Verde is filled with desirable custom single family and attached homes. The rolling topography, towering mountains and oversized one-third to one-half acre lots provide for amazing views. The community built its first home in 1973 and is now home to about 980 homes. Active adult homebuyers enjoy living in a large home that is still single-level and low-maintenance. Homes come in many sizes and prices with two to five bedrooms, two-and-a-half to five-and-a-half bathrooms. Active adults of Rio Verde live a luxurious, resort-style lifestyle. With less time having to worry about the exterior maintenance of their homes, homeowners have more time to enjoy all of the great amenities and clubs offered throughout the community. Whether it's an arts and crafts group, sports club, card game, or golf tournament, there is always something happening in the Rio Verde Community Center as well as the Rio Verde Country Club Clubhouse. 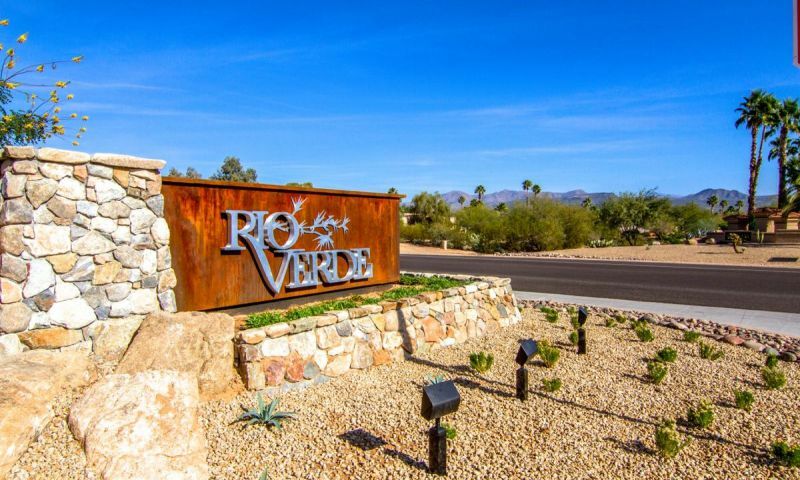 Rio Verde is a wonderful 55+ community near Phoenix, Arizona. It's situated not far from Troon and Fountain Hills. Located about 45 minutes from an international airport, traveling is never difficult. It's ideal location is also just 50 minutes from downtown Phoenix and just a half hour away from major medical facilities. Rio Verde is situated on 765 acres just north of Fountain Hills. This isolated community is surrounded by the 20,000-acre McDowell Mountain Regional Park, the Fort McDowell Indian Community and the 2.9 million-acre Tonto National Forest. The community center is just one of two facilities available to Rio Verde's residents. Rio Verde Community Center - 18,000 Sq. Ft.
Rio Verde Golf & Country Club includes a clubhouse and two golf courses. There are plenty of activities available in Rio Verde. Here is a sample of some of the clubs, activities and classes offered here. Rio Verde is made up of about 980 residences. Homebuyers can select a single-family home or attached townhome. Most homes within this community range from about 2,599 to 4,882 square feet in size. Many custom homes have been built throughout the years as well. Please Note: Due to the age of this community, not all floor plans are listed below. 55places.com is not affiliated with the developer(s) or homeowners association of Rio Verde. The information you submit is distributed to a 55places.com Partner Agent, who is a licensed real estate agent. The information regarding Rio Verde has not been verified or approved by the developer or homeowners association. Please verify all information prior to purchasing. 55places.com is not responsible for any errors regarding the information displayed on this website.